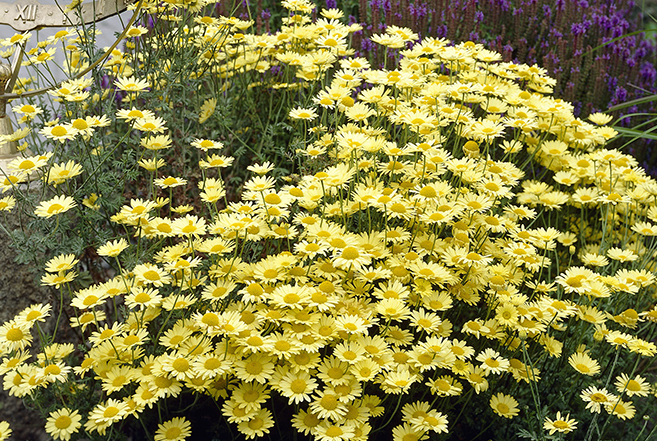 Anthemis are perennials or annuals with slender, aromatic foliage and gorgeous, large and showy white or yellow daisies. Anthemis look great on banks, slopes or used in beds and borders within a cottage or informal garden setting. You should expect to see Anthemis grow to an approximate height of 50cm (20”) and a spread of 1m (40”). Anthemis are best planted in well-drained soil of loam, chalk or sand within an acidic, alkaline or neutral PH balance. Dig a hole that is the same depth and width as the root ball. Space companion plants 40cm (16”) apart and mixing a generous amount of peat moss to the planting area, mixing thoroughly to keep the ground moist. Water thoroughly and deeply to settle the soil into place. Anthemis are best positioned in an area of full sun. Deadhead flowers regularly in order to encourage a further flush of flowers. Prune lightly in the spring to maintain a neat and tidy shape. During the winter, provide Anthemis with additional protection = surround the base of your plant with a generous layer of mulch or provide fleecing if in particularly cold or exposed areas. It is possible to propagate Anthemis by seed, division or basal cuttings.